TACO SHOWDOWN — PROVO ATTACK!!!! Are you ready for this? Are you ready for another taco showdown? Are you ready for animated GIFs of splosions? Maybe you said yes to the questions above, but I hope you are firmly seated in your Internet chair for the next one…. Are you ready for PROVO? That’s right, the next episode of TACO SHOWDOWN is in Provo, UT. 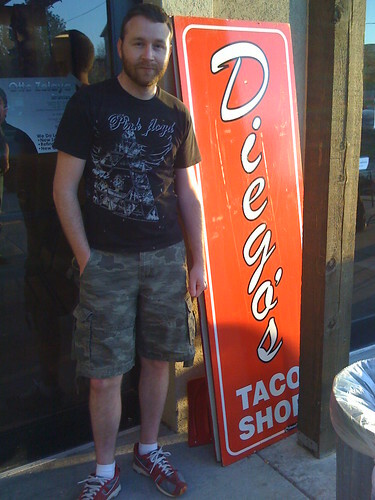 I know, I know… The website is technically named http://www.slctacos.com, but several enthoustiasts have written in about great tacos in Utah County. So I gathered some friends and we decided to take a drive to try these tacos. And remember what Provo feels like. We suspect the real reason Utah County earned its Happy Valley nickname has something to do with the region’s bountiful supply of top-notch restaurants—especially Diego’s. The modest-sized Mexican eatery is home to some of the best tacos anywhere in the state. Really, everything on the menu is a hit, from Al Pastor and Carnitas to quesadillas and burritos all topped with a fiery green avocado salsa. With a recommendation like this, I had to try it to I sounded the taco alarm to assemble a Taco Showdown and several of my favorite taco enthousiast amigos jumped in Taco Force 1 and Taco Force 2 and set a course for Provo. 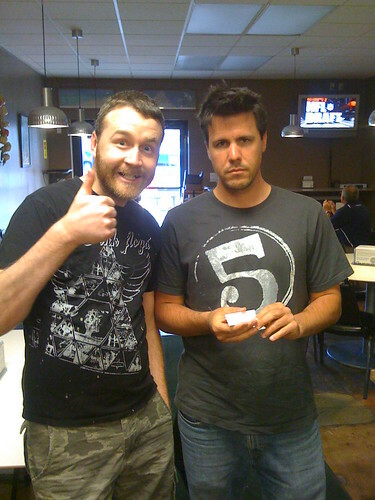 In this photo, taco enthousiast Jason is visibly "amped" to try the tacos while taco enthousiast Dave is slightly more "reserved". Upon arrival at Diego’s Taco Shop, I laied everything out on the table. I told the woman behind that counter that we were taco journalists who had traveled from Salt Lake City after hearing legendary reports about their tacos. For some strange reason she didn’t take us very seriously. Perhaps it was because we were not carrying our taco journalist credentials or since we don’t dress like your typical run-of-the-mill taco journalists? At any rate, I ordered an Al Pastor and a Carnitas and sat down outside to prepare myself for what I was hoping to be an experience that might remove some of the unpleasant taste of Provo, Utah. We waited outside for a bit and briefly considered getting tattoos at the tattoo shop next door. I, like yourself Dear Reader, was also surprised to see such a thing in Provo. Finally, our tacos arrived and I started testing out the Al Pastor. I was immediately underwhelmed. Normally I like an Al Pastor full of flavor unique to the marinade recipe of the taco preparer. Instead, I was met with a taco which was not unappetizing but did not stack up the explosion of flavor which I typically expect from an Al Pastor. 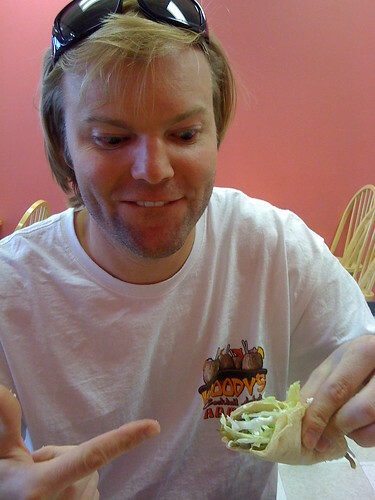 My fellow taco journalists looked to get an early idea of my review by the look on my face. Instead, I continued eating quietly and started work on the Carnitas taco. 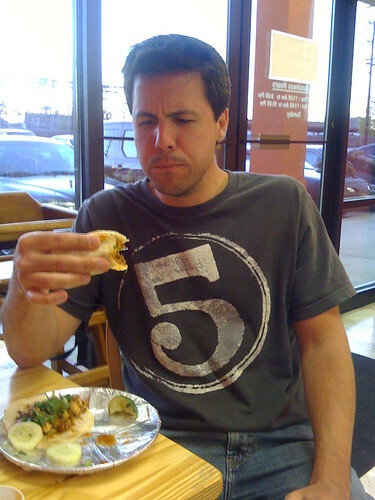 This taco was better but once again I could no longer hide my expression showing that I was a little bit disappointed. Had the shop not been hyped by musicians and other journalists, I would have been able to enjoy these a bit more. But given the hype, it was almost crushing that these tacos were to be filled under “middle of the road”. It was even more crushing that the road we found ourselves on was in the middle of Provo. But don’t despair. The Taco Showdown doesn’t end here. We also visited another location in Provo. A location which is clearly a favorite by many slctacos.com fans given the number of comments we have received about its Provo location alone. 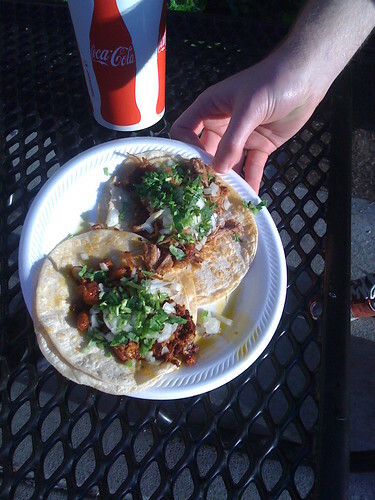 Read on and follow us on the dramatic conclusion of this taco adventure. It's clear that taco enthousiast Amanda is not going to let Provo get her down and she happily poses as we leave Diego's in search of better tacos. 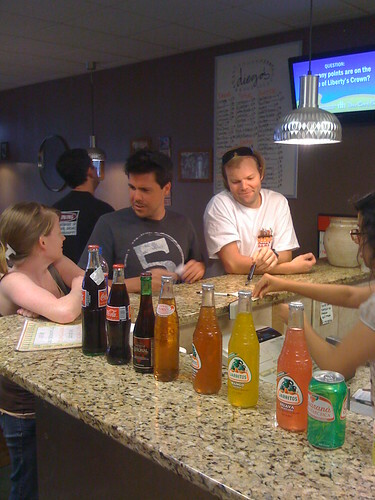 Taco enthousiast Ryan takes a large bite as taco enthousiast Quinn wonders if any of the Provo locals recognize us as rockstar taco journalists. 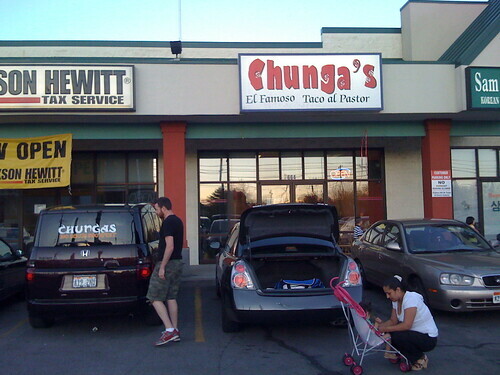 In 2008 I first ate at a little restaurant called Chunga’s in Salt Lake. That night I met the owner Gilberto who is an incredibly nice gentleman. We ate and laughed. I even cut a cake with them that evening and found a plastic Jesus inside. That night Gilberto told me that he hoped I enjoyed the food since he was already planning to open a second location in Provo. I fell in love that night with the delicious array of tacos and other offerings that Gilberto and his crew were serving up and I vowed that night to travel all the way to Provo (not a small feat for those less brave) to visit his location there to ensure the same level of quality and write a review of the location. Let me just skip ahead and tell you that the tacos you get at this Provo location are the same delicious tacos we have come to know and love from the Salt Lake location. I arrived at the restaurant with my taco enthousiast amigos as part of the second and final round of a Taco Showdown of taco restaurants in Provo. The first round was not bad, but failed to live up the taco hype we had traveled for. My amigos seemed a bit nervous. Were we about to end this taco adventure on a high note? I could tell from their demeanor that they were not sure how this was all going to turn out. However none of the taco enthousiasts in our crew had eaten at either Chunga’s location below. Once again I ordered an Al Pastor and a Carnitas burrito to hold the variety of tacos constant to compare to the other round of the Taco Showdown. Meanwhile my fellow taco enthousiasts ordered a full battery of tacos ranging from the lengua (tongue) to the Al Pastor to the nopal (cactus). We sat down and sipped on our delicious fruit aguas and watched Mexican soap operas on the TV as we waited for our tacos to arrive. I sat back and watched my compatriots as they took their first bite of the Al Pastor. I sat back and watched them taking their first bites of an experience which reminded me of first bites of a true Al Pastor I had on the streets of Mexico city. One by one they started smiling and it was clearly agreed that this taco adventure was a complete success. 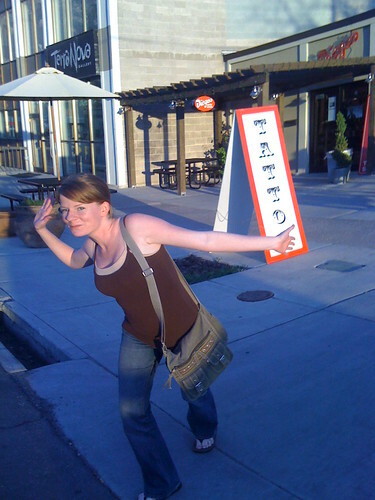 Our trip to Provo, although treacherous, had not been in vain. It was immediately decided that there was no contest as to the winner of this particular Taco Showdown as it was evident that Chunga’s was the winner. We tried a few of the different tacos available at Chunga’s. The nopal was another crowd favorite and taco enthousiast Quinn and Jason ordered a few more at the counter to prolong our taco experience as long as their stomachs would allow. Although he is probably not ready for the famous 27 Taco Challenge at Chunga’s which was attempted by taco enthousiast Seth, Jason was the winner of the most tacos eaten trophy. I can’t remember how many he ate in total, but I certainly do remember being impressed. As we left the restaurant, we were presented coupons for a free taco. We had not mentioned that we were taco journalists, but still we were treated and fed like kings that night. The great folks at Chunga’s are always warm an inviting — no matter whether you are a taco journalist or not. 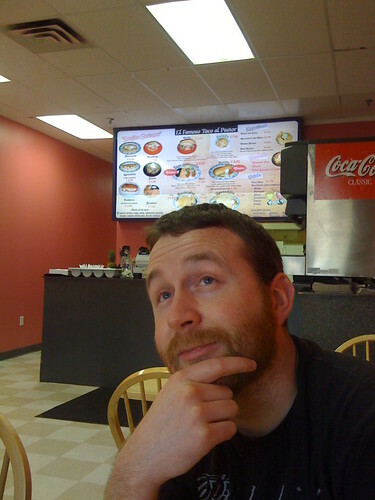 While visibly displaying his own internal critical analysis, taco enthousiast Dave decides that the tacos exceed his expectations.